FeiyuTech Vimble 2 Review – The ultimate gimbal for your iPhone? 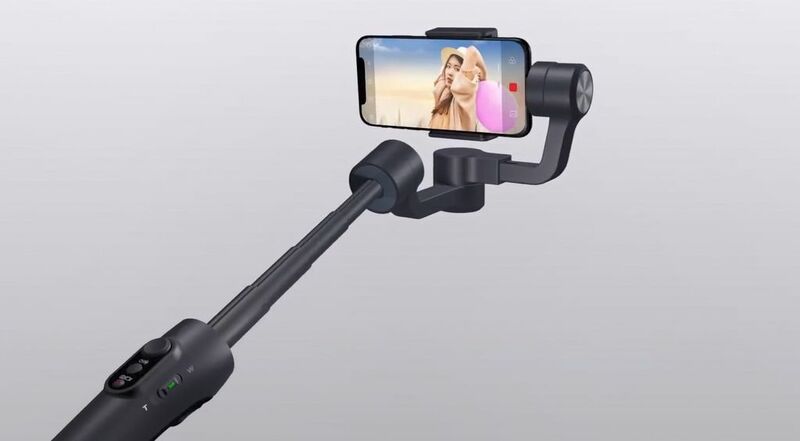 Tim Nicholls July 23, 2018 July 23, 2018 No Comments on FeiyuTech Vimble 2 Review – The ultimate gimbal for your iPhone? This is 2018, and without a doubt, smartphone photography is now a thing for everyone. These days almost everyone has a high quality camera in their pocket; the cameras and sensors in modern smartphones have improved leaps and bounds. Now, for all those who love taking selfies with their phones, the FeiyuTech Vimble 2 stabilizer is an excellent gadget to add to your gear bag. I use it to capture wider angle pictures with friends or shoot super smooth movies, with none of the shakey camera work that used to be common with videos shot on iPhone or Android devices. So, what is so great about the FeiyuTech Vimble 2 smartphone gimbal? The feature that makes this handheld gimbal stand out is the Extension Bar, a built in selfie stick. The newly added 18cm long extension bar makes it simple to take great selfies and group photos. It gives smart phone wider frame and the beautiful scenery can be framed in easily. It’s a great feature that really sets it apart from the current competition like the Zhiyun Smooth-Q and the DJI Osmo Mobile 2. The Vimble 2’s battery holds the juice for a whole 5 hours when used continuously. That is easily long enough to capture all those exciting moments without missing a shot. 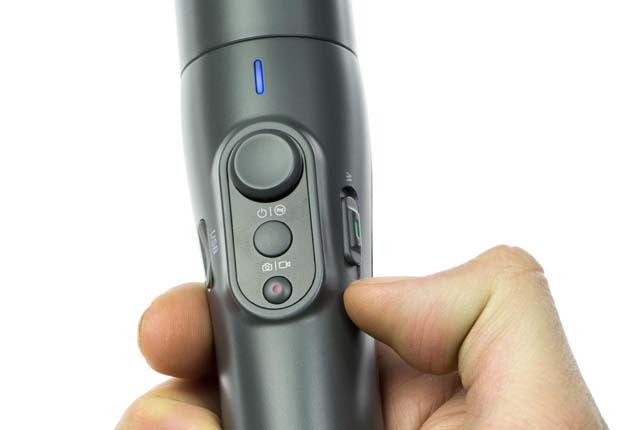 The gadget has two micro USB port on the grip side and the top to connect to a power source. The Vimble 2 only weighs about 428 grams without the smartphone payload. Although it’s light, it feels solid in your hand. With other cheap gimbals, for example when I reviewed the Zhiyun Smooth-Q, the gimbal felt a little cheap and plasticy. Like FeiyuTech Vimble C the new model permits 320° revolution on all axes. Conversely, FeiyuTech SPG permits 360° turn on the pan pivot. However, I find that I rarely need a gimbal to spin a full 360, as I’ll almost always be able to position my hand to account for it. Unpacking the FeiyuTech Vimble 2, What’s in the Box? I love opening boxes. I haven’t met anyone who doesn’t. Firstly, considering the size of the gimbal, the Feiyu Tech Vimble 2 comes in a sightly bigger box than is needed in my opinion. The initial impression I got upon opening the box was the meticulous assembly and the beautiful design. I have also evaluated the technical details, and I found the design very appealing. The box is beautifully designed and offers some insights on what to expect inside. Along with the Vimble 2 itself. There’s a bundle of papers with the instruction manuals, a battery, USB cable, and the , a tripod and a string, which I find quite exciting! The gimbal stabilizer incorporates a selfie stick, which is a great new feature. When going out, I would almost always use a wearable gimbal like the Evo SS reviewed here, on the end of a separate selfie stick. Bringing multiple devices in your backpack is not ideal, with the Vimble 2 this is a thing of the past! The FeiyuTech Vimble 2 also includes a little tripod, and a standard 1/4″ tripod mount is at the base of the handle. Another incredible extension is the rotatable clamp for your phone. In previous models such as Feiyu Vimble C and SPG, picture portraits could only be changed electronically and required a restart. With the Vimble 2, you can without much strain turn the clamp and place your cell phone in portrait mode. Furthermore, you can slide your device smoothly thanks to the incorporation of a cross arm. The additions also guarantee a secure mount, with the added convenience of a charging port at the top of the cross. The Vimble 2 features a control panel with a flat joystick to control the head tilt and movement. There is a power mode button at the bottom of the panel and a shutter button at the side that works with the Vicool application on your iPhone. Using the control panel of the smartphone gimbal allow is easy: click the shutter one to take a photo or hold for video. There is even an LED indicator showing the current mode. There is a smooth zoom lever on one side of the handle, and on the opposite side, there’s the miniaturized USB port for charging. I especially like the trigger button on the rear. When you squeeze it, you briefly enter a locking mode that fixed the orientation. The Feiyu Vicool app allows you to connect the iPhone stabilizer to upgrade firmware, set parameters, apply filters, edit videos, and access the device remotely. To consume less power when connecting, first, link the smartphone gimbal and iPhone using Bluetooth. Noteworthy, I use a fully-fledged application to capture breathtaking pictures and videos from my iPhone. The Vicool app offers better interfacing between your iPhone and the Vimble 2 smartphone gimbal. There’s an added advantage when it comes to the Vimble 2. It is not only compatible with smartphones but also action cameras such as GoPro. This makes it a great choice for people looking for a gimbal for gopro and smartphones . Feiyu Vimble 2 is compatible with many smartphones including all iPhone models, Huawei P9, P9 plus, Samsung Note 5 and Galaxy S7. The maximum width and weight of compatible smartphones are 57-84mm and 210 grams. Place heavier devices a little higher for better levelling. 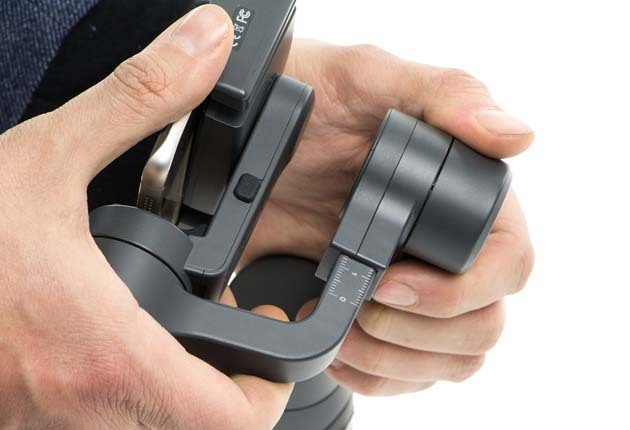 The FeiyuTech Vimble 2 features a new clamp design that is better than the previous one used in the Vimble C and Feiyu SPG. I have used both, and I find the new type very refreshing. You do not have to flip to portrait mode electronically and therefore; you can mount an action camera on manually. You don’t need any extra accessories, and you can still access the shutter button at the top. However, you cannot use the touchscreen panel as with the iPhone, but you can still turn your camera over 180 degrees. 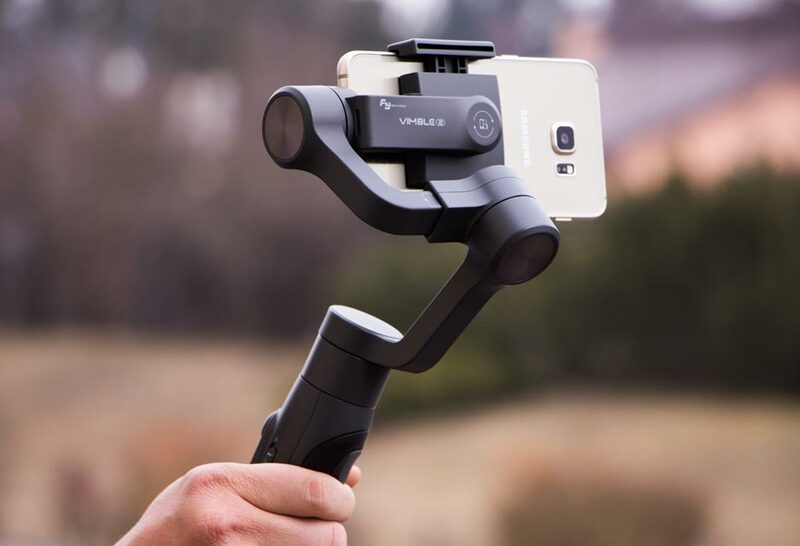 Vimble 2 is a perfect combination of gimbal and selfie stick. It uses integrated controls that enable adjustment of the camera angle for better pictures. The extension lies neatly packed between the gimbal and the handle, and you can still access controls even after extending the gimbal. The extension is only about 5.5 inches and is there to help hold my iPhone a little further. One of the most interesting features that ii uncovered was a new and very effective stabilization mechanism. Using the Vimble 2, I can take still images in nearly all circumstances for a very affordable cost. 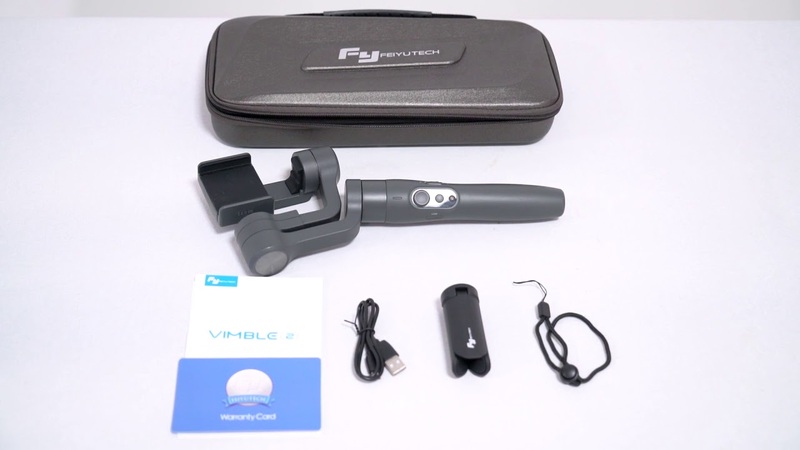 Feiyu have released the Vimble 2. It is available in most stores around mid April 2018. You can find it on Amazon, and buy directly from Feiyu-Tech. This gimbal is a fantastic piece of technology and iPhone stabilizer. It is one of those smartphone gimbals that offers outstanding performance, and I think that is spectacular. It is clean, compact, and works extremely well for the selfies. I am definitely recommending it to everyone who loves traveling and taking beautiful pictures on their iPhones. Have fun trying it out! If you are looking for the best waterproof gopro gimbal, check out our favourite Feiyu WG2 Gopro Gimbal. It’s the best option if you are shooting action sports videos. Maybe you have a compact digital camera, or even a 360 camera, like the Ricoh Theta V the check out our FeiyuTech G360 Review.